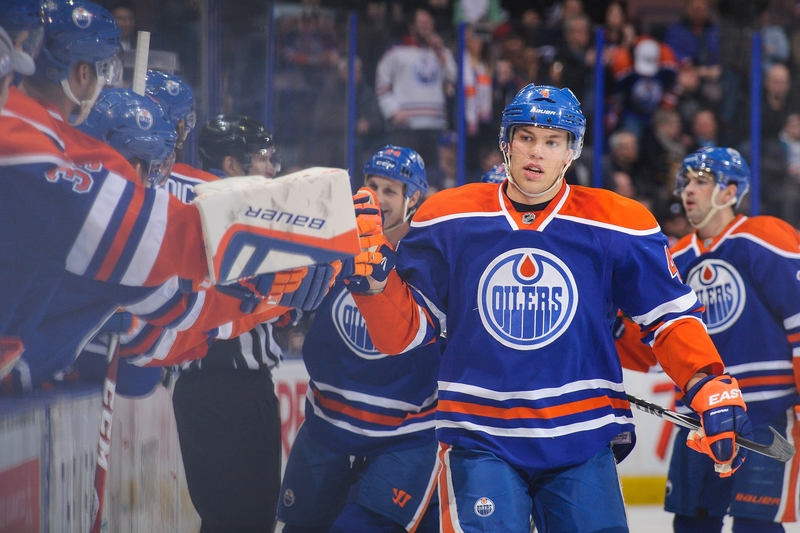 Taylor Hall, the Oilers No. 1 pick in 2010, celebrates after scoring against the Sabres on Thursday at Rexall Place. EDMONTON, Alberta – The Edmonton Oilers are in a rebuild. They’re finishing consistently low in the standings and getting high draft picks, including the No. 1 overall choice three straight years. It seems like the way the Buffalo Sabres want to go. After losing Thursday’s game, 3-1, against the Sabres in Rexall Place, the Oilers are still 29th in the NHL’s overall standings. And they’re wrapping up their eighth straight season without a trip to the playoffs. For Sabres fans and other observers who think the high draft choice mode will immediately turn the Blue and Gold into the next Pittsburgh or Chicago, you also have Edmonton’s path to ponder. The Oilers are Exhibit A of how it doesn’t always work out. Edmonton lost Game Seven of the Stanley Cup final at Carolina in 2006 and hasn’t made the playoffs since. The Oilers took Sam Gagner at No. 6 overall in 2007, got Jordan Eberle at No. 22 in 2008, whiffed at Magnus Paajarvi-Svensson at No. 10 in 2009, got Taylor Hall at No. 1 in 2010, Ryan Nugent-Hopkins at No. 1 in 2011 and Nail Yakupov with the top choice in 2012. While Hall has become one of the NHL’s top scorers, Nugent-Hopkins and Yakupov have not. RNH has just 38 goals in his first 170 NHL games while the Fail for Nail campaign that marked 2012 has produced just 28 goals in 111 games. Hall entered Thursday tied for 18th in the NHL in scoring with 64 points. Meanwhile, Eberle (knee) and Yakupov (ankle) missed Thursday’s game. So what’s gone wrong? The Oilers have always been weak in goal, something they hope they’ve fixed with the deadline acquisitions of Ben Scrivens and Viktor Fasth. The defense corps has been iffy as well. But the signing of free agents Justin Schultz (from college) and Andrew Ference (from Boston) have helped. They took Sault Ste. Marie defenseman Darnell Nurse at No. 7 last year and likely could use Barrie stud Aaron Ekblad this year. Close observers of the team point out there’s been no players in the age 25-27 range to help young players through their growing pains. There are veterans like Ference and Ryan Smyth on the roster but few elite mid-range players. The prevailing wisdom is the Sabres will take a scoring forward in the draft – likely Kootenay’s Sam Reinhart or Kingston’s Sam Bennett — and that the Oilers will target Ekblad if they get the No. 2 pick. But they could still draft as low as No. 5 if they keep winning, as they entered Thursday 10-4-3 in their last 17 games. Hall has been a bright spot in Edmonton, improving his play each year and not getting bogged down by his label. “It’s tough to live up to that sometimes,” said Ference. “There’s a lot to learn about the differences from junior to here. The really talented player has the ability to play the game without really worrying about their own game. They have enough talent. They’re good enough. Ference went through this in Boston. The TD Garden was pretty empty some nights immediately after the lockout as the Bruins were an afterthought while the Red Sox, Patriots and Celtics owned the town. Slowly but surely, the Bruins made the necessary moves in the draft and elsewhere to build a Stanley Cup team.